I figured I would finally give you all a kitchen update! Sometimes I'm not very good about follow up around here, it's my ADD, hard to stay on topic. The cabinets are finally all painted! I owe a whole other post on that, we are barely DIYers around here so it was definitely a tedious task but I'm pretty proud of us! I promise to share pictures and details soon. We still have some more work to do until it's finally complete so for the time being I'm sharing my idea board. The walls were already painted Sherwin Williams Grassland and we went with Sherwin Williams Snowbound on the cabinets. It's definitely a white but it's not too bright white if that makes sense. Sherwin Williams hands down is my favorite paint brand and our local store is awesome and great to work with. 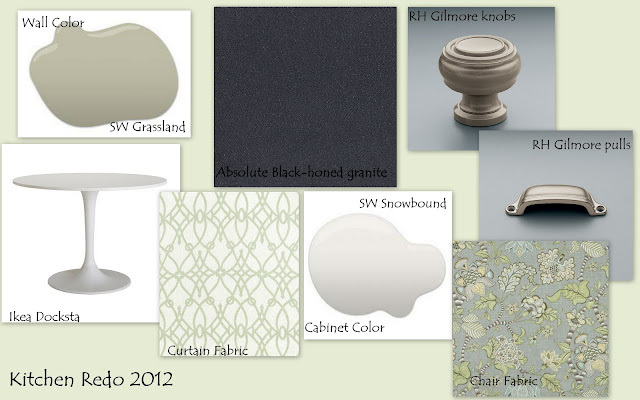 Since we saved so much $$ painting them ourselves I'm splurging on the counter tops and knobs/pulls. I'm leaning toward a black honed granite. Honed granite has a matte finish rather than a shiny one which I am partial too. For the doors we're doing the Restoration Hardware Gilmore Knobs and for the drawers we're doing the Restoration Hardware Gilmore Pulls both in the satin nickel finish. We have a bay window in our kitchen so the Ikea Docksta table fits perfectly. I have some old chairs that have been in my family for years, they just need a coat of paint or stain and new fabric and they'll be perfect. We're hoping to have everything finished within the next few weeks so I promise I will share pictures then! love love love B&W kitchens!!! we bid on a house that had this, with huge windows over the sink. sadly, that's not the house we live in. but one day i'll have the B&W kitchen i've dreamed of...can't wait to see pics! Oh my goodness. I love your choices for the kitchen! We did the same thing for the white cabinets and the dark countertops. We used Raven Caeserstone. It is more gray than black but I love it so far. I cannot wait to see the finished product! Cannot wait to see pics! Kitchens are my favorite places in the whole house! can't wait to see how it turns out!! I love all the things you picked in your mood board - it will look gorgeous I'm sure!! Grassland is one of my favorite greens! Love it! Going to look so good! Can't wait to see it when its finished! I'm excited to see pics! I have the same fabric in my kitchen!! Love it!